1) What is the general return policy on MyGetWellStore? We offer you complete peace of mind while ordering at MyGetWellStore- you can return all items within 14 days of receipt of goods. If you are not satisfied with what you have bought, we gladly take it back within 14 days from the date of delivery. 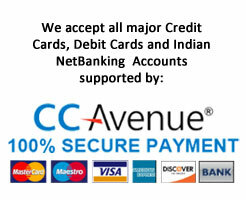 If you have paid by card then we will reverse the payment. In case of Cash on Delivery or Bank Deposits as modes of payment, we will issue a cheque in the registered name of the customer. We also will refund you the shipping charges in store credits. Please ensure however that the product is unused and the tags, boxes and other packaging are intact. If an item is found defective, please get in touch with our customer care on support@mygetwellstore.com or call us on +91-0712-6452666 within 14 days of receipt of the product. We will arrange a reverse pickup for the product and then issue either a full refund or store credit for a different item in exchange, as per your request. Please note that replacements are subject to availability of the particular product. 3) Is there a category specific policy for returns? Some special rules for promotional offers may override "MyGetWellStore.com's 14 Day Returns Policy". In case of any queries, please write to our customer care on support@mygetwellstore.com or call us on +91-0712-6452666. 4) I need to return an item, how do I arrange for a pick-up? Wherever possible we will facilitate the pick-up of the item through MyGetWellStore or through our courier partners like DTDC, Professionals, INDIA POST etc. In case, the pick-up cannot be arranged by us, you can return the item through a third-party courier service and we will return the courier costs in form of redeemable points for future purchase. 5) What are the modes of refund available after cancellation? MyGetWellStore Reward - If you choose this option, the amount will be added to your MyGetWellStore reward points. Once you have requested the cancellation of item(s) in your order, MyGetWellStore will complete the cancellation and initiate the refund, depending on your preference. If Order Cancel Before Dispatch:If order is cancelled before dispatch, full Refund will be made. If Order Cancel After Dispatch:Refund will be made, after deducting the Shipping/freight Charges only. Your order will be replaced free of cost, once you refuse the parcel & mentioning on the courier return as damaged goods & retain the copy from the delivery boy and attach it to the RMA (Return Management Authorization) being raised. 7) What is the validity period of reward points? The validity period of reward points is generally 180 days from the date of issue. Please check your reward points email for exact date. 8) When you return an item, refunds are issued to the payment method used at the time of purchase, except for Cash on Delivery. This is the time your bank typically takes to credit the refund to your account/ card. In case of paper cheques, it's the time the courier service typically takes to deliver the cheque to you.